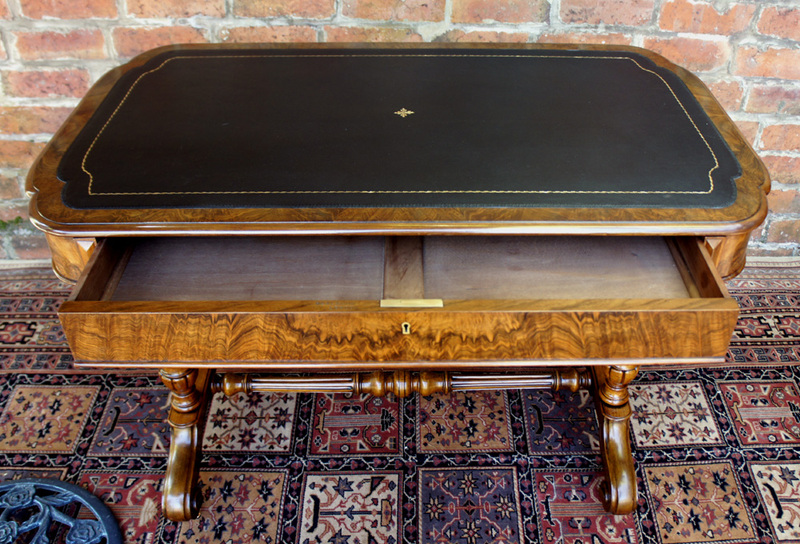 This very attractive antique burr and figured walnut writing table is stamp marked 'Heals & Son, London' to the top of the drawer. The shaped top has a well figured cross-band of walnut with a 'bulls nose' moulded edge. 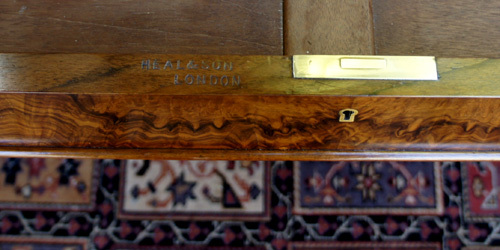 Beneath the frieze is fitted a single drawer with mahogany lining, hand cut dovetail joints and original brass lock. The table stands on 4 turned, carved and fluted end supports with shaped feet terminating in scrolls and the original brass casters. 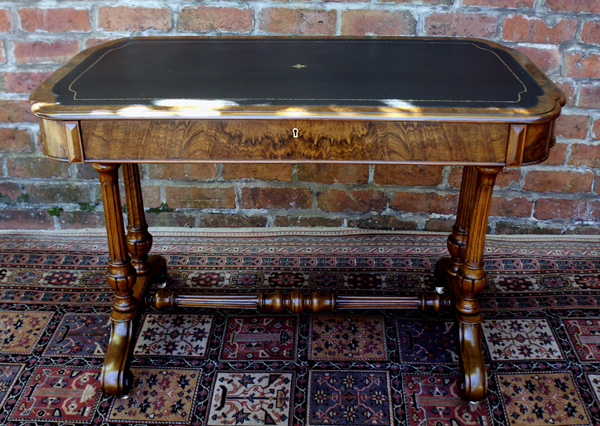 This very attractive antique burr and figured walnut writing table is stamp marked 'Heals & Son, London' to the top of the drawer. 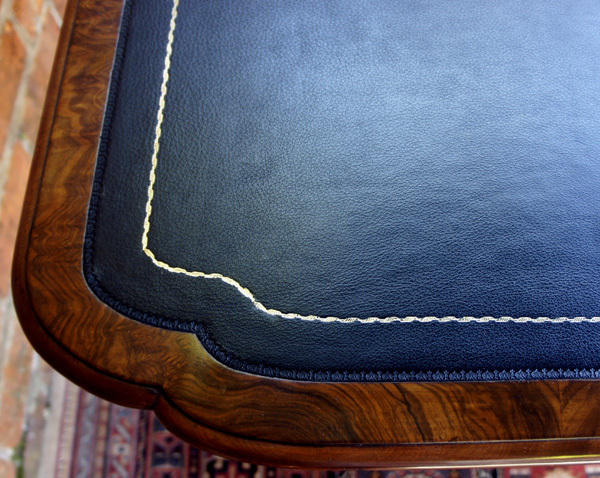 The shaped top has a well figured cross-band of walnut with a 'bulls nose' moulded edge. Beneath the frieze is fitted a single drawer with mahogany lining, hand cut dovetail joints and original brass lock. The table stands on 4 turned, carved and fluted end supports with shaped feet terminating in scrolls and the original brass casters. These are united by a similarly turned and fluted stretcher. 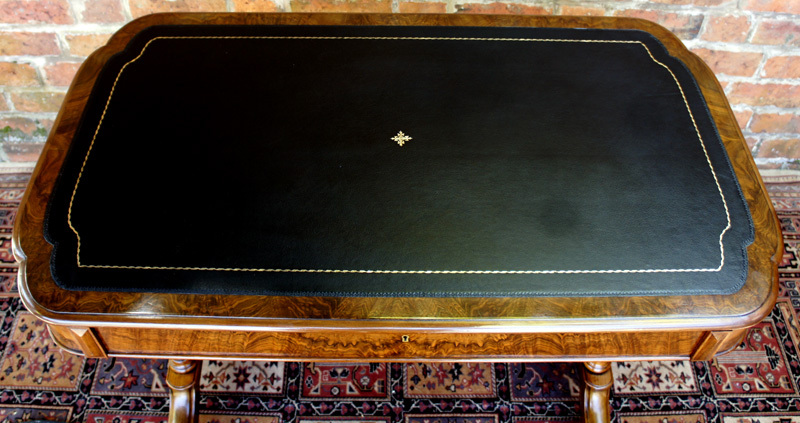 It has recently been cleaned and polished and has been fitted with a new black hide writing surface with gilt and blind tooling. This lovely burr walnut antique Heals writing table is of the best quality and made to the highest standards of craftsmanship. A beautiful small writing table that would look make a lovely desk or occasional table in a traditional or contemporary setting.